Ask any Italian why you should go to Sardinia and they’ll respond, probably a little wistfully, “Il mare, è stupendo” (The sea, it’s stupendous). Italy’s second-largest Mediterranean island is surrounded by an achingly beautiful sea of glass-clear, profoundly blue and green waters. Though a countless number of beaches could justly brag that they’re the most beautiful on the island, those along the Golfo di Orosei, on Sardinia’s central east coast are the stuff of screen savers and vision boards the world over. Some are smooth and sandy; some are steep and pebbly; some of them are easy to reach; some require a bit of work and planning, but all of them are worth the effort. Yacht-size ships hold 100 or more people and are usually the cheapest option, and they typically offer creature comforts like lunch aboard, bathrooms, and a smoother ride. However, they can also have a cattle car feel and will stop at fewer beaches. Gommone, or zodiac rafts, can be booked with or without a driver or guide. Guided gommone take a maximum of 12 people and provide a fun, bumpy ride as your sea-tested captain bounces over the waves from one beach to the next. These guides know all the nooks and crannies of the coast, and will even motor into grottoes or pursue schools of frolicking dolphins. If you choose to rent your own gommone, you can stop where you want for as long as you want. Either guided or self-piloted, gommone get you closer to the shore and stop at more beaches than do the big boats. Boats of all sizes depart from the town marinas at Orosei or Cala Gonone. Most head first to the southern end of the gulf, then make their way back north, stopping at beaches and coves along the way. There’s one thing missing along this tranquil chain of five sandy, shallow-water beaches: crowds. With an entry fee, a daily limit of just 140 cars and 30 motorcycles, and plenty of room to spread out, the Biderosa Oasis is a quiet paradise with plenty of amenities. Services include a food truck, porta-potties, and umbrella, beach chair and canoe rentals. Walking trails crisscross the 860-hectare site, and flocks of flamingoes and other migratory birds make seasonal pit stops at the lagoons of Biderosa. There are no daily entry limits for walkers or cyclists. Plan to arrive early to either of these two sandy beaches just to the south of Biderosa; both of which are great for their scenery, calm waters for little kids, and grown-up diversions like snorkeling, kayaking, and paddle-boarding. Located northeast of the village of Sos Alinos, both Cala Liberotto and Cala Ginepro are easily accessible by car. There is plenty of parking at both beaches (paid at Cala Ginepro; free at Cala Liberotto), plus nearby bars, restaurants, and beach rentals. Once there, choose a spot shaded by scraggly juniper and pine trees or for snorkeling, base yourself near one of the rocky points, which hide hidden, calm pools of dazzlingly clear water. Located in the town of Baunei in the southern part of the Gulf of Orosei, the beach at Cala Goloritzé was created by a landslide in 1962 and is famous for its 143-meter-tall pinnacle that rises above the cove. This UNESCO-protected, boulder-strewn, pebble beach backed by severe granite cliffs will likely be your first stop by boat if you book a trip on a yacht or gommone. Motorized vessels must stay 300 meters (nearly 1,000 feet) offshore, meaning most guided boats make just brief stops for photos—anyone who wants to reach the shore from a private boat has to swim. As a result, you’ll have it largely to yourself if you can actually reach the beach. If you choose to hike in, it’s a 10-mile drive from Baunei, the closest town, to a parking area at the Golgo Plateau. From there, the 90-minute hike to the beach involves elevation changes and rock scrambling, as well as intense sun and heat in summer months. Hiking boots and plenty of water are essential. Your reward is worth the toil: swimming under a natural sea arch, snorkeling with schools of fish, and sunning on what feels (almost) like a desert island. However, if you do choose to hike to Cala Goloritzé, be sure to allow enough time for the hike back to your car before dark. Calas Mariolu and Cala Goloritzé vie for the top spot on many a “most beautiful beaches” list. If you’ve made the effort to hike to Goloritze you can continue on to Cala Mariolu, but it’s an extreme hike with sharp vertical descents. Instead, plan to arrive by boat. Gommone and larger vessels can pull right up to shore here and drop off passengers, then anchor offshore and wait. If the beach feels a little crowded, dive into those cerulean waters and you’ll quickly feel like you’re in another world altogether. As you continue on your boat tour, jump in at Piscine di Venere, or the Pools of Venus. Though the beach here is off-limits due to frequent rockslides, the deep, ridiculously clear, fish-filled waters are among the most inviting in the gulf. Your guided boat will only make a quick stop here—and we guarantee you’ll wish it was longer. This sand and pebble beach is a real stunner, with a sea arch on one side and vertical cliffs on another, plus massive rocks that serve as ideal dive platforms. Cala Bariola is a smallish beach, so not quite as many charter boats stop here compared to Mariolu or Cala Luna. Though you technically can hike to Cala Bariola (also called Cala Birìala), it’s at least three hours from the nearest parking facility or town. You’re much better off on a skippered or self-driven gommone. Famous for its huge sea-carved caverns that extend deep into the rock face, this oft-photographed beach is a mix of sand and stone, with a fairly steep shoreline and water that gets deep quickly. Cala Luna is backed by a shallow lagoon with kid-sized boat rentals, and you can also dine at a rustic restaurant and bar nearby. You can walk here via a three-hour hike from Cala Fuili, a pebble beach near the town of Cala Gonone. 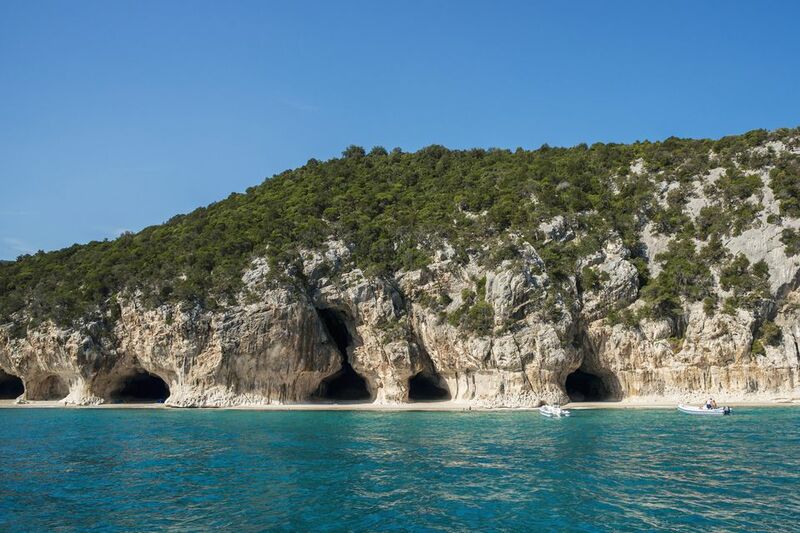 On the way, make a detour to the Grotta del Bue Marino, an ​otherworldly sea grotto with daily tours. Alternatively, you can also do as most visitors do and arrive at the grotto by boat.